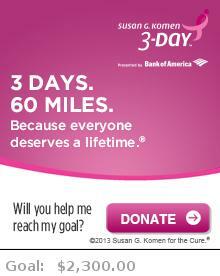 I am walking in the Michigan Komen’s 3-Day. Join me in the fight and donate today. Big or Small efforts are much appreciated and will not go unnoticed. Today I’m grateful for another year with my dad. Today he turned 66 – Happy Birthday dad. I see the moon and the moon sees me. And how everything comes onto the light. Today I am thankful for the moon and the light has shown tonight. They say that you should learn something new everyday and this will help your mind stay active and lesson the chance of Dementia later on in your life. Over the past few years Dementia has reared it ugly head on my dad’s side of the family – first with my grandmother, then her sister (my aunt), and I fear it might be starting to show signs in my dad. Now it’s hard to tell because my dad has so many health issues, but mostly heart, back, and legs, that the mind wasn’t one we were watching for – but seems with the history we should keep vigil watch over this disease. It’s scary to me too, since I feel like I am overwhelmed, stressed and forgetful at times. I can only hope that I am trying to exercise my mind everyday and am making myself more aware of the signs. Learning something new…I’ve been fighting with myself because I’ve been struggling with a new job and learning its process, but today I gave in and stopped struggling-ok maybe only for a moment. It seems like I have way too many struggles, in way too many areas in my life. Maybe no more or less than anyone else, but it still blocks the good energy I seek and the balance I long for-but I refuse to give in and give up the fight. I guess you can say that the fight can be both good and bad, the yin and the yang…so Today I’m grateful for my fighting spirit. I guess the Irish is coming out and showing her GREEN! Faith. I sometime feel like I lose myself and my faith, but I know that there is a bigger power than myself. I always have faith, there are just somedays I have to look harder for it. Today I felt lost. I felt overwhelmed, confused, and completely out of faith. In one moment, one glimmer of my faith showed itself and reminded me that I am never alone. I might still feel out of sorts and exhausted, but I am being carried through my rough times and reminded to never give up on my hope and faith. Today I have Faith and I am grateful for that one glimmer that made me turn to look once again. Today I’m just thankful for the 5 minutes of rest I had at the end of the day. 4 days of stress and that 5 minutes was the most important thing of my day and that I am very thankful of. This is a dual post as I was sick and wasn’t able to lift a finger to type. I’m grateful for my health and being able to get meds, see a doc, or simply rest in my bed to feel better. I’m also thankful and amazed at the body and what it can withstand and endure over a course of time. My dad is living proof and I’m thankful for our medical practices with which we us. Happy Birthday Grandma F. I sure do miss ya and I am thankful for all the time I did have with you when you were here with us. I could always ask for more time but I think the lesson was to spend as much time with the people you love so that when its there time for them to go you don’t have any regrets. So…thank you for always being there for me and showing me your love.